If you're a teacher with an academically diverse classroom (and what classrooms aren't today? ), you need this resource. Framed around the critical elements for success in today's classrooms, Making Differentiation a Habit gives educators specific, user-friendly tools, including differentiated instruction examples, to optimize teaching, learning, and assessment for all, including gifted students. 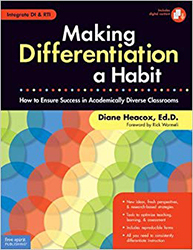 Following on the heels of Diane Heacox's best-selling teacher resource, Differentiating Instruction in the Regular Classroom, this book offers new ideas, fresh perspectives, and additional research-based strategies to help teachers seamlessly integrate differentiated instruction practices into their daily routines.